We were asked to visit a client in Northampton, as part of their Privet hedge had died. It sounded like a case of Honey Fungus. (Privet is very susceptible). Unfortunately there are no chemicals to control the problem, therefore the only choice was to excavate the area and destroy the infected root material. Having visited the site we obtained a soil sample, sent it off for analysis and it was confirmed that Honey Fungus was present. We excavated the affected area, adding in a rubber lining (to prevent the fungus spreading to unaffected areas of the garden) and replaced the soil. We sourced and planted replacement Hornbeam hedging (less susceptible to the problem) and installed an irrigation system to water the hedge during its early years. 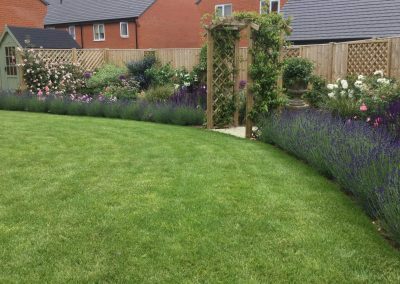 A client in Northampton contacted us to use our Garden Design Planting Service, replacing a shady border in the back garden which was in need of being refreshed. 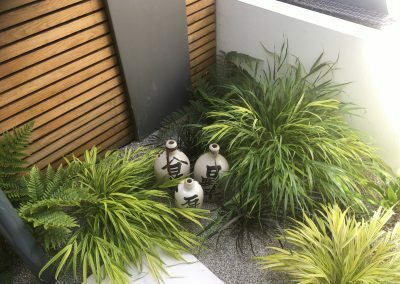 Whilst talking through the changes with the client , it was also agreed that we would produce a small garden design, which included the replacement of grass with gravel. The site is located on clay, so organic matter was added to help improve the soil structure. 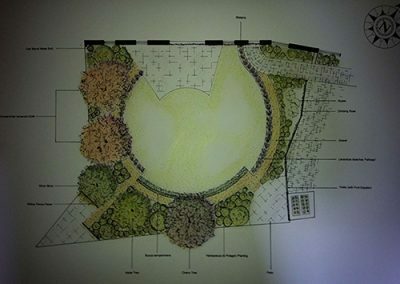 We were asked to provide a design for a front garden in Northampton. 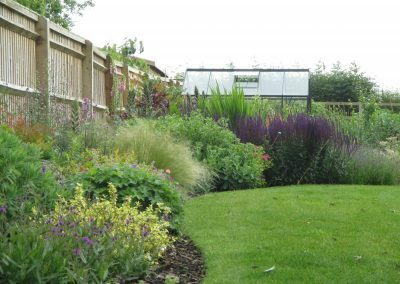 The primary focus was to replace a tired uninteresting space with an interesting low maintenance garden. This involved the removal of 2 brick walls, a rotting Cherry tree and digging out the grass which was growing on heavy clay soil. Soil improvement was next and having sourced the plants, they were planted up. Shortly after, Cotswold Buff gravel was added providing a Mediterranean feel. The final stage saw the introduction of two large box balls and one large box cone. This provided real structure to the garden and also ensured the client benefited from all year round interest. The client was really pleased with the results and received a lot of positive feedback from her friends & neighbours. We were recommended to clients who were in the process of buying a new Cotswold Stone house in Oxfordshire. The brief required a design for both front and back gardens, including height changes of over a metre. When visiting the site, we were excited to see an old well in the grounds, however, the original intention during the build was to cap the well off. Following our recommendation to the client, the well was rebuilt and will provide a fantastic talking point when visitors come to stay. The design not only catered for height changes, but also provided the clients with a formal garden for entertaining, integrating seamlessly with a small woodland area, where their children would play.